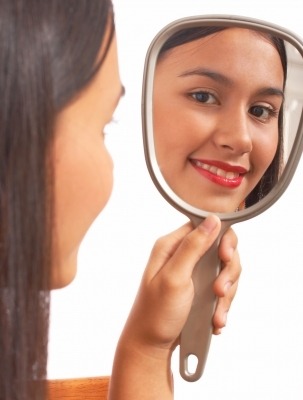 Help your teen be proud of who they see in the mirror- teach them to be significant. Today in church I heard a great little tidbit from Pastor Rick Warren. He said, “Seek to be significant, not prominent.” I thought that was extremely applicable to the teenagers here in Orange County. We’re trained to differentiate ourselves, be a leader, and try to stand out from a very young age. The fact is though, there can really only be a few leaders. Everyone else has to be a worker-bee. We need to teach our teens that this is not a bad thing. I have seen a number of teenagers in my counseling office who are struggling with the fact that they don’t stand out. Sometimes they are frustrated they don’t stand out academically. Other times they wish they could be the best athlete on their team. Still others desperately long to be the most popular teen in their school. They often see themselves as insignificant because they aren’t prominent. For your adolescent to believe they lack significance because they are not prominent is a fallacy. Significance is something one decides to develop. It’s our job as the parents of our children to help our kids focus on doing significant things. It’s also our job to help them understand that these actions are not usually glorified, or attention-grabbing. Here’s what I mean: It’s very significant for your teenager to go to a party where everyone else is drinking alcohol but they choose not to drink, and maybe even call you to pick them up. It’s significant for your adolescent to be one of the slower runners on their cross-country team, but they are always positive and cheering on the other runners. It’s significant if your teenager chooses to acknowledge and respect you in front of other kids, even when it’s unpopular. It’s significant if your adolescent volunteers at a soup kitchen on a Saturday morning before all their other friends are up; none of these things garner prominence. If you work very hard at helping your children make a contribution to this world, and help them understand that for the most part those actions do not get them attention or accolades, you will help raise happy, self-assured, motivated teenagers. You will teach your teen what it means to have humility. You will help your adolescent know how to work hard. You will teach your child integrity and honesty. They won’t mind taking the longer road if it’s the right one. They will be patient, intentional, focused, and able to set long-term goals. In short, if you teach your teenager the importance of being significant, whether or not that gets them prominence, you will help them develop strong character and inner contentedness.